KADUNA – The Atiku for President (AFP) organization has welcomed the declaration of president Muhammadu Buhari to seek a second term in office, saying that his glaring failure in many ramification makes it easier for former Vice President, Atiku Abubakar to defeat president Buhari at the polls 8n 2019. In a statement made available to Vanguard, the National Publicity Secretaryof the group, Emmanuel Oguche said “President Muhammadu Buhari’s declaration of interest in the 2019 presidential election is the best news the Atiku camp has been hoping for. “While the President is constitutionally entitled to a second term in office, we are however taken aback that going by his failure to carryout the simplest of all tasks and the unprecedented division, along all the fault lines, that he has brought upon the nation, he seems to be the best his party is still trying to push forward. We expected the ruling party to look inwards and bring a fresh person who will not be carrying the baggage of the failure of the last three years and who can at least give Atiku a run for his money at the polls. “One, never before in the history of this nation have we recorded the number of job losses witnessed in the last three years and this is because the people running our lives have no experience in job creation and no workable template for youth empowerment. Atiku, with his background as a globally-renowned entrepreneur, youth-friendly advocate and philanthropist is the answer. “Two, while the present administration has been mentioned too many times as being run by nepotic and narrow-minded people, Atiku is that man who on account of his large-heartedness and cross-national family/marriage ties, feels the pain of the Igbo spare parts dealer in Nnewi, understands the plight of the Ijaw fisherman in Nembe, identifies with the aspirations and fears of Fulani youths in Dutsinma and imagines the trials and tribulations the cocoa farmer in Owo is facing. “while this administration struggled for six months to look for ministers and ended up appointing people who can’t be said to be among the country’s ‘Best Eleven’ and whose performance has been dismal at best, Atiku is a world-class talent hunter who will not waste time to appoint credible Nigerian professionals to join him in repositioning the economy,” the statement read. It added that the present administration has failed in its own core areas of interest – economy, anti-corruption and security and left the youths disillusioned and frustrated and even more angry that the president wants to continue for another four years. The group said it will mobilize 4 million youths with voters’ cards to vote for Atiku in the 2019 election. “Our core mandate is to mobilize 2 million Nigerian youths with Permanent Voters’ Cards who also have the capacity to mobilize at least one friend or relative with PVCs to vote for Atiku in the 2019 Presidential election. We are a group of like-minded young, vibrant, cerebral and articulate grassroots politicians. We have established formidable structures in all the 8810 wards, 774 local government areas and 36 states of the federation as well as Abuja for the purpose of advancing the Atiku presidential cause,” the statement concluded. 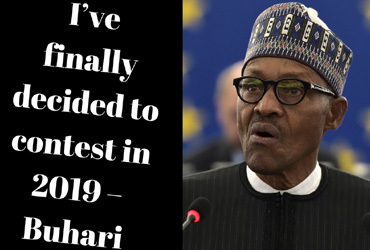 The post Buhari’s declaration best news – Atiku’s camp appeared first on Vanguard News.